Used in sports stadiums around the world, we know that fake grass can take a pounding – but would you have it in your backyard? 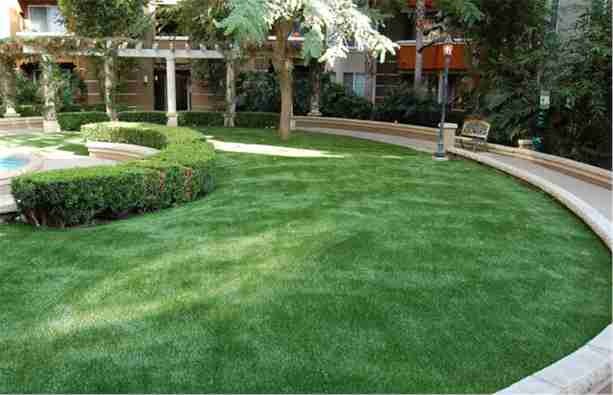 With water conservation becoming a priority and more and more homeowners searching for the year-round green, synthetic grass is becoming a thing. It’s softer, it’s skinnier and it’s more natural that the Easter grass you remember. While it’s a bigger trend in America’s Sunbelt where the governments there are offering rebates and subsidies, it’s still tempting to think about an evergreen lawn with little maintenance for the next 20 years. It’s June and you’ll want to start getting a handle on all those early summer chores before the mercury rises and things become virtually impossible (if only we’re so lucky so much sun!). You’ll want to start by looking for any damage the long winter did to your property, start hardening your home against mould and rot and start looking around for wasps, pests and other problems. Early summer is the best time to get a jumpstart, so get outside and start searching for problems. Did you know that the average Canadian throws away between $20 and $40 or the equivalent of 10KG of perfectly good food each and every month? That adds up to almost $500 a year in some cases - a nice little mortgage payment that could be going towards a new home! Notice how some people in your neighbourhood seem to have just been "blessed" by the lawn gods? You try year in, year out to replicate their results and you end up with a patchy yard. Sure, you could hire a professional to handle your yard, but it's a point of pride. If you've been on Pinterest lately, you've probably seen some of the new trends emerging for this year into next for bathrooms and kitchens. Say goodbye to those country style sinks and wash basins and hello to undermount sinks in your bathroom. Get fancy with bathroom furnishings and touch activated faucet so even if you have your hands full you can get things done. According to a recent American study, homeowners may be able to afford a higher priced home if it’s new – but how much does that apply to the rest of us? According to the study when you factor in the rest of the costs of buying a home and the long term costs over the first ten years of ownership, a newer home can be much more reliable. Here we’ll talk about if this translates well into the Canadian market and if buying a new or newer luxury home for sale can really save you money. The American Heart Associate released a report last week that says owning a dog not only is linked to a reduced heart risk, but it may actually help you live longer. This might be one of those “correlation does not imply causation” results – but either way, people who have dogs are more active. Maybe active people have dogs, but maybe dogs make them more active. It’s just another great reason to have a pet (or companion animal, if you’re so inclined). Let’s face it, you just can’t sell luxury homes for sale with a messed up roof! You’re going to need a professional that knows how to patch up that roof and make it sparkle – but how do you know you’re working with a real professional? Here we’re going to talk about things like referrals, knowing they’re licensed and asking for examples of local previous work to make sure they’re on the up and up. Don’t go for the cheapest roofing contractor, make sure you’re going with the one that’s going to give you the best work at a price you can afford. When you’re trying to move luxury homes for sale, you could have a hard time figuring out just what people really want. First we should take a look at just who is buying homes – from single women to the huge proportion of Gen X and Gen Y buyers out there, you’ll be surprised at just how much people expect when they’re looking at homes. They want man caves with mini theaters and bucket seats, they want smart homes they can control with their smart phones. They want big closets and they’re willing to pay for it, as well as beautiful home office spaces that can convert to another room in a snap.